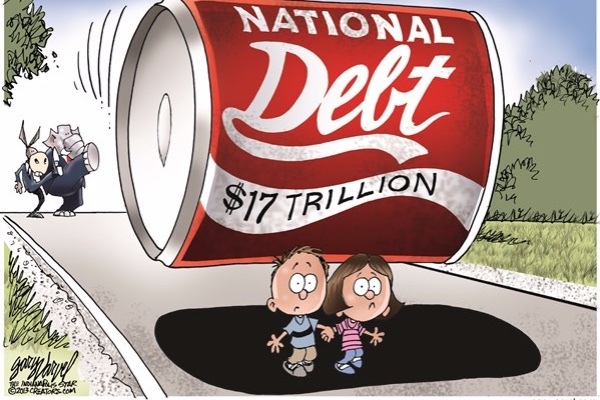 The interest on the national debt will hit $1 trillion. National Debt Bomb. Here are the latest news items and commentary on current economics news, market trends, stocks, investing opportunities, and the precious metals markets. We also cover hedges, derivatives, and obscura. And it bears mention that most of these items are from the “tangibles heavy” contrarian perspective of SurvivalBlog’s Founder and Senior Editor, JWR. Today’s focus is on the national debt bomb. (See the Economy & Finance section. JWR’s Comments: At this point, the best that we can hope for is to locate ourselves in the most conservative and survivalble states (such as Idaho or Montana) and hope that DC fully implodes in its own debt mess. In the aftermath constitutional conservatives could rebuild a new currency and government that is truly constitutionally-limited. That would mean: Honest, gold-backed money. Zero deficit spending. Term limits. A flat tax. The balance of power returned to the 50 states. Eliminating most Federal agencies. The chances of that are slim. Ditto for a popular uprising. The alternative is just witnessing the continuing gradual descent into socialism, social engineering, social credit scores, eugenics via abortion, socialized medicine, civilian disarmament down to just kitchen cutlery and harsh language, a 100%-tracked (and horribly taxed) electronic currency, non-answerable and entrenched politicians-for-life, sovereign states in name only, a top tax rate of 90%, an eventual ban on privately-owned cars, a ubiquitous surveillance state—the whole Nanny State Shebang. So pray hard, folks! At Wolf Street: Fed’s QE Unwind Reaches $434 Billion, Remains on “Autopilot”. Here is a news flash for any blog readers that have an FFL, or at least access to a dealer who charges reasonable transfer fees: Palmetto State Armory (one of our affiliate advertisers), has put their generic mil-spec “Safe and Fire” AR-15 lowers on a short-term sale at just $39.99. (At their web site, search for: SKU: 1728.) With a legislative steamroller headed our way, it is wise to stock up! Buy a dozen, if you can afford them! There is a chance that those could be worth $200 apiece, in less than a year. “QuadrigaCX said in mid-January that Cotten had died while traveling in India due to complications from Crohn’s disease. At the time, Global Affairs Canada – the government agency that manages diplomatic relations – seemed to confirm Cotten’s death, but only in vague terms. “Amidst an intense economic recession and uncertainty in the country’s government, the Venezuelan bolivar has essentially become valueless. Sadly, this old lady agrees with JWR about what is coming to America. It is slow, insidious, and FEW Americans know history and that it always repeats itself. America was a brief experiment by our few Founding Fathers and 3% who broke the ties with England. No Nation before, or since has tried and “almost” created a free/Capitalistic nation. Technology is truly a double edge sword, and will crush out most of the “flame” of freedom which will rest quietly in a few minds and hearts. Ayn Rand’s first short novel “Anthem” reads like a fable, but provides insight into what happened and what someday again occurs somewhere on Earth. Prometheus will be truly “chained” until someday, hopefully the flame of freedom will burn again. Perhaps America is/was a brief experiment, but don’t forget that the pendulum swings back and forth, and America has experienced ‘renaissances’ of renewed enthusiasm for freedom over its lifespan. With so many conservatives and liberty-minded people waking up and realizing how far our politicians have moved away from the guiding principles of the Constitution, there’s always a chance that things can improve. Just look at the Nov 2016 elections, and the incredible (and surprising) results that resulted in the current ‘renaissance’ nobody foresaw. Now in 2019, so many more of us are awake and involved than even three years ago. That’s encouraging, I believe. If we love to tout the famous ‘3 Percenters’ that made all the difference during the Revolutionary War and paved the way for our freedoms, then let’s be the ‘3 Percenters’ of today. I would dare to say it’s more than 3% now, and growing. Don’t be discouraged by the MSM’s disproportionate portrayals of the Left’s infringements on our rights. Here in my home state of CA, we have more conservatives than the entire populations of most other states(! ), and believe me, we’re miffed and taking action. There are many lawsuits winding their way through the courts at all levels against the State, the AG, Sanctuary Cities, County Boards, leftist Sheriffs, etc. And it’s my understanding that some of our own conservative Sheriffs in the northern rural counties are voicing their support of their brethren in WA and NM who are refusing to comply/enforce their own states’ gun control laws. I believe we may be witnessing a division among our nation’s Sheriffs along the lines of which ones are politicians, and which ones have the best interests of their people in mind. Should be a small enough govt. that customs, duties, tariffs funded the govt. until 1913. If nothing else, a 5% consumption tax on all goods except bread, milk, eggs, and cheese. Ditch the income and property tax. The Brits still have an ‘Alloidal tax’ where you pay a once time fee on your property…then it’s yours in toto. No more bond issues and mil levys where folks who don’t own property get to vote on free stuff from folks who do. I agree. When this whole clown show of a country well and truly hits the rocks, and something better is built from the wreckage, I for one, will not compromise with those who would put a legal claim (also known as taxation) against my life, liberty and property. No more taxation with the government’s gun pointed at my head. I AM praying hard and contacting my reps in Washington in hopes of at least slowing down our “long march” into socialism. BTW, for anyone interested in Ayn Rand’s novella, Anthem (see hl’s comment), it’s in the public domain in the US and is available for free at Gutenberg.org in two versions (not sure of the difference) and as an audiobook. Gutenberg provides multiple formats for most books. If you have an iPad and download the epub version, it can be opened and read in iBooks. I believe it’s still copyrighted in Canada, however. Check you laws if not in the US. I am currently attempting to relocate to the American Redoubt from the left coast. 30 year veteran commercial construction manager looking for employment with like-minded contractor. Please contact me if you are aware of any possibilities. If you are looking for employment as a CM the commercial field Boise is the place to be the economy is very strong here. I came to ID. from CA. 7 years ago and had no problem finding work, did not stay in the work force long as i had just wanted to make some contacts for some good tradesmen and to find the good supply houses. The wage scale is not the same as CA. but the good workman is worth his wages, and the trade off in wages is OK because the quality of life is immeasurably better than CA. We came from CA 6 years ago when we saw the writing on the wall. Agree 100% about leaving CA behind. We were political refugees escaping the nanny state. Tons of like minded ex-CA here in Boise. Welcome. I doubt there will be 50 states. The USA is already 11 nations (search on that term). The Redoubt is “far west”, but it extends down to the Mexican Border. When the crash comes, it will depend on how strong the Chrisians are – both men and women – to let God’s judgment happen. We are the ants, they are the grasshoppers. The Navy can’t keep from crashing into other ships. The Army can’t defeat Afghanis or Iraqis – they can kill many but we are still there. The Air Force? Bombing concentrated locales like cities works, but when everyone is scattered? And when the music and SNAP/EBT stops? And doesn’t start again? Will you put up barriers to the Golden Horde? In the Parable, the 5 wise virgins kept their oil and refused to share it with the 5 foolish virgins because there wasn’t enough. Today, they would have been called names for not sharing. This is not to say don’t help anyone, but you need to know someone before you should help them. If it is your neighbor that helped you, great. If it is someone who just shows up? Movng to the Redoubt showed me that honor and trust still exist – in the Redoubt and a few other areas. The few leftists will call you names and insist you do things their way, but they should be left outside. Even when someone honestly repents he does not become pastor the next day. In this case I think Sodom will be leaving Lot instead of vice versa. Don’t play Lot’s wife and do a long stare back and run after it. We will be the remnant to reenthrone Christ, and reestablish liberty and the Constitution. I am unsure praying FOR the debt bomb to explode or to pray FOR an honest small Govt with the items Jim suggests above, the old time cynic in me, leans to let it collapse and restart again, will I survive to see a new great country arise ? dang if I know, I am tired of the corruption in DC , tired of the military industrial complexes lies and arrogance. Came to Idaho six years ago. Boise is a mess – taxes, housing shortage, etc. Might look at southeast Idaho. Growing area, still low house prices, shortage of tradespeople. Try Idaho Falls or Pocatello on for size. You might be surprised.